Takagi Water Heaters are sized according to the peak flow rate requirements, extreme temperature-rise scenarios, and types of applications. Heating water only as it’s being used means you will never run out of hot water again. 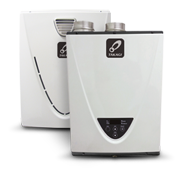 Learn more about the benefits of owning a Takagi Tankless Water Heater! Locate a licensed contractor in your area! Go here for a list of Installers and Takagi Contracted Service Providers in your area that can assist you! Find Local Installer or Service Provider!